My 2-year-old granddaughter, Zoey, loves scissor cutting activities. Like all 2 year olds, she’s working on the fine-motor skills and technique needed for cutting. 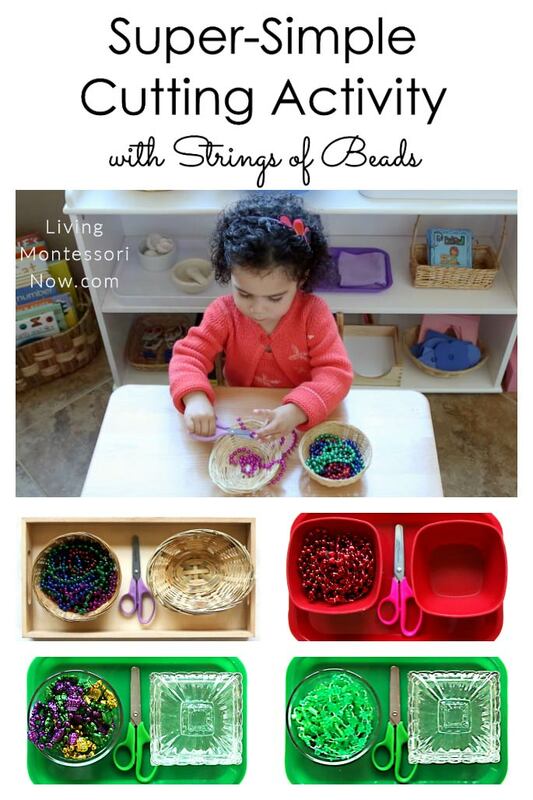 So I put together some inexpensive and super-simple cutting activities using strings of beads. 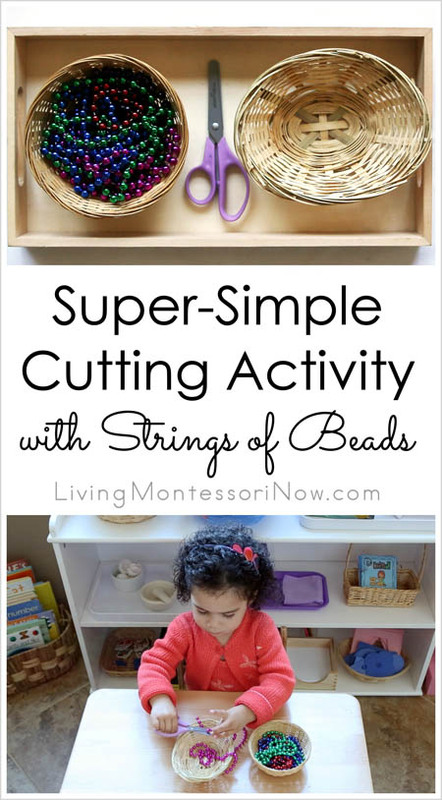 One of the easiest and most appealing cutting activities to have available for 2 year olds through preschoolers is one that uses strings of beads. Strings of beads are easier to cut than paper, and they’re just lots of fun. You’ll need to show a 2 year old how to hold the scissors. And you might need to hold the string of beads for your 2 year old to cut. Another trick is to have the bead strings pre-cut to lengths of approximately 2 inches. They’re easier to hold than a long string for a child who’s first learning to use a scissor. 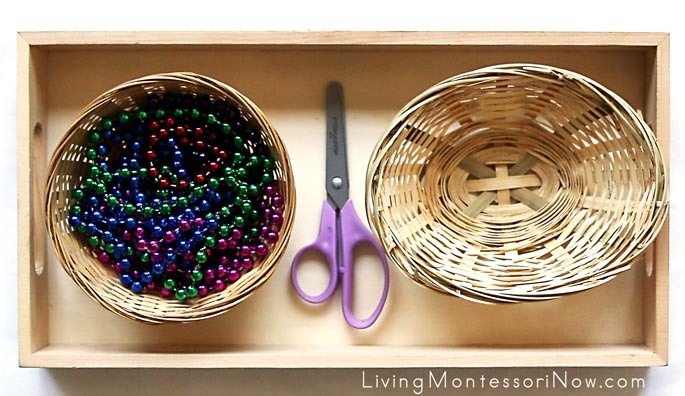 I always keep Multicraft trays and Montessori Services baskets available for many activities. I also have Fiskar kids’ scissors in a few different colors. At Zoey’s age, I keep the scissors up out of reach when she’s not using a cutting activity. I got my beads at the Dollar Tree, although you can also get strings of beads on Amazon. 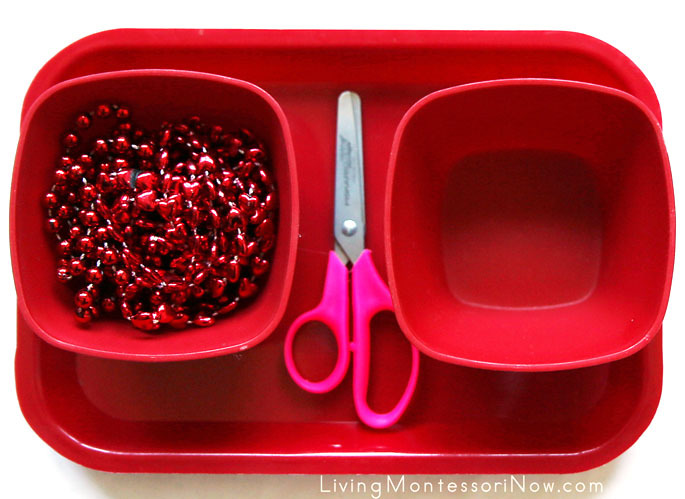 I used red heart-shaped beads on a string for a Valentine’s Day cutting activity. 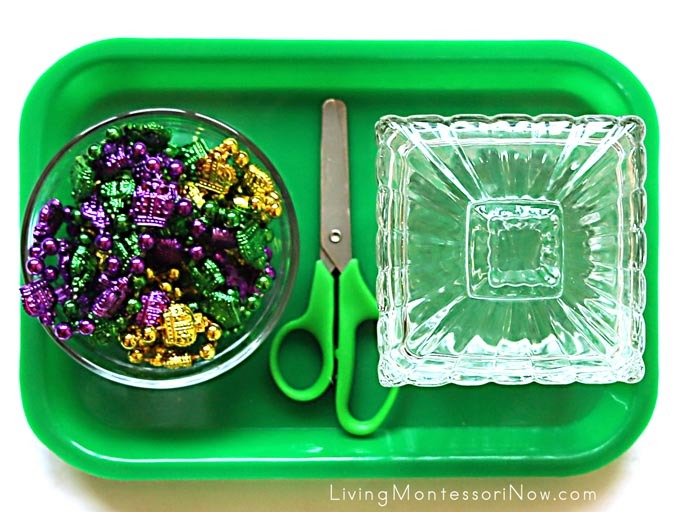 The tray is a Montessori Services medium-size tray. Red and gold circular beads on a string would make a nice Chinese New Year cutting activity. I got my Mardi Gras beads at the Dollar Tree, although you’ll find a variety of Mardi Grad beads on Amazon. I used a pretty crystal box for the cut beads. 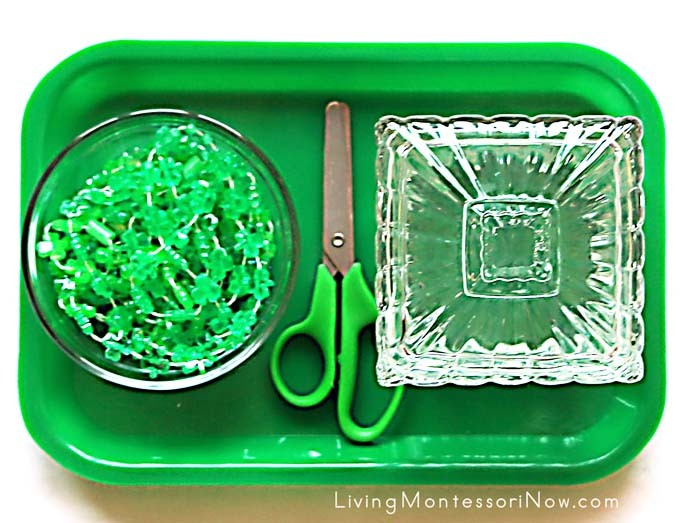 It’s often nice to use a special container for some of your Montessori trays so that your child or students feel it’s special and want to be extra careful with the activity. Because Mardi Gras is only observed for a short time, I keep the same tray and switch it to a St. Patrick’s Day cutting tray as soon as Mardi Gras is finished. Again, my beads are from the Dollar Tree, but you can find strings of shamrocks or round St. Patrick’s Day beads on Amazon. We’ll have lots of fun over the next month and a half switching up our cutting activities using strings of beads. Zoey’s doing great with her cutting skills already, and I can’t wait to watch her progress! You’ll find Montessori-inspired cutting activities using a variety of materials in my post about developing scissor cutting skills with Montessori-inspired activities. I also have a post with many ideas for Montessori-inspired paper cutting activities. 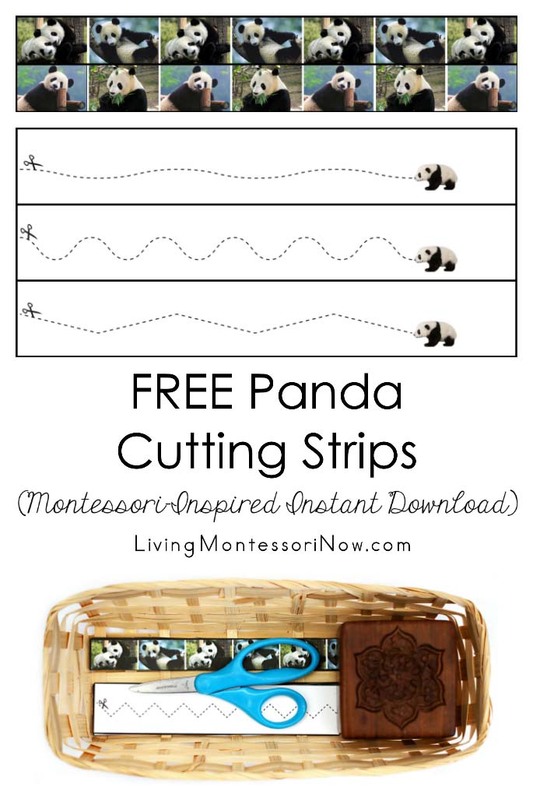 Update: I now have lots of free instant-download cutting strips at Living Montessori Now (such as these cute panda cutting strips)! 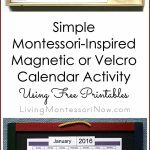 They’re themed to go with my Montessori-inspired themed pack (subscriber freebie) for the month. 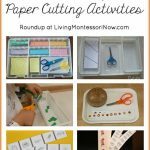 What’s your favorite activity for developing scissor cutting skills? We have a collection of these beads that we’ve gathered over the years. What a great use for them! Thanks for sharing at the Thoughtful Spot! I never would have considered cutting those necklaces from the dollar store apart but I think my kids will love this! 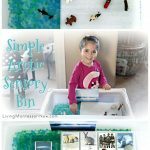 We don’t do Montessori exactly but teaching life skills is important to me and my oldest child has some delays in this area. 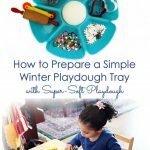 Can’t wait to surprise my kids with this tray idea! Thanks. This is such a great idea. 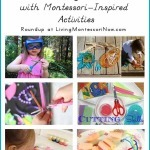 I love how the kids can use it for glueing and ladling later on.